So today was awesome estate sale day. Made up for last week by going to some local family run sales that were really just trying to get rid of stuff. Scored about a thousand chistmas lights for five dollars, a really nice older food dehydrator..(glider snackies anyone?) some shelving, and tools and other bric a brac but the most interesting thing was some really thick soft ropes. turns out they are some sort of nautical or boat ropes. They are brand new I guess or super clean, no odor no wear and tear. They are super solid and heavy too. So I hung a few up and looped one through the cage, Wendy and Lisa sseem to like them. So no real question there unless there is something I don't know which is why I always come here. So Wendy has become the golden child. She is always the first to notice and greet me, always on my shoulder, getting really good at letting me hold her, pick her up, scratch and pet. I really try to include Lucy but she's a maniac . She only calms down when she is exhaused and even then she's a handful (or not) I wonder if they get jeaslous and that is what is causing the slight change in the cage atmosphere? I have tried to just have some Lucy bill time but she's usually not that into it. 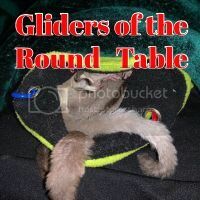 anyway I have decided that I really really want some super small led lights for the glider wheel so when they have it cranked up full speed the lights come on and spin around. I don't know I guess anothe project. Here is a picture for everyone, have a wonderful night! How cute! Does she like you to read to her?